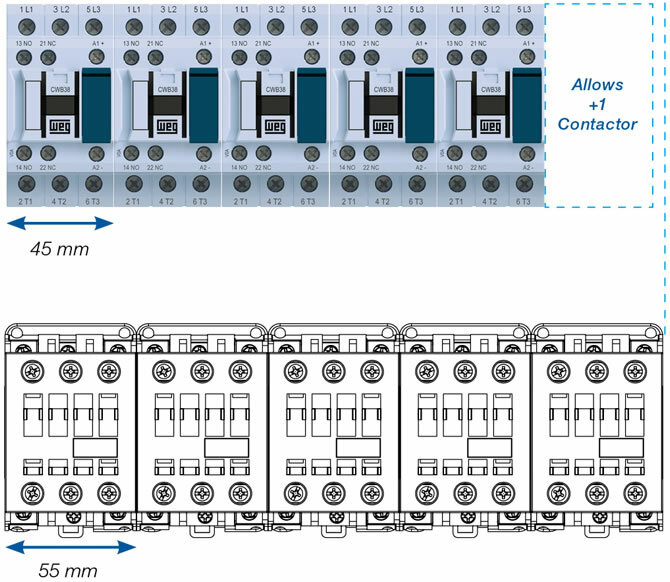 Compact SolutionBecause they are compact, 45 mm wide and available in up to 38 A (18.5 kW @ 400 V), CWB contactors lead to an overall reduction in size of electric panels if compared to traditional solutions of contactors with the same ratings. Built-in Auxiliary Contacts 1NO + 1NCThe configuration of two built-in auxiliary contacts (1NO + 1NC) makes the application of CWB contactors more flexible in most automation systems, contributing to the optimization of internal space of electrical panels. “Zero-Width” Mechanical InterlockMechanical interlock with no additional side space. Quick and easy toll-free mounting. A perfect fit without increasing the size. Additional Contact BlocksSide or front mounted auxiliary contact blocks with 4 additional auxiliary contacts. DC Coils with no Inrush Pick-Up Current Low consumption D.C. coils allow direct control through PLCs without the need for coupler relays.